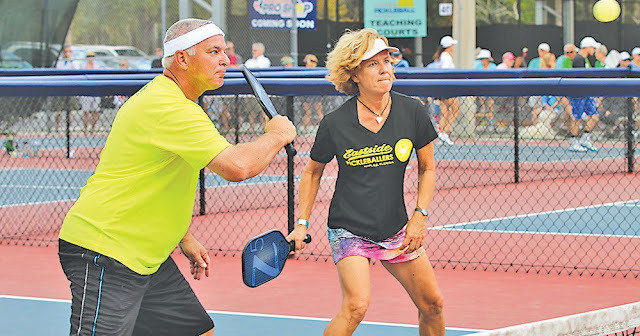 The Southern Tropics Tournament Series kicked off in December with the Florida State Pickleball Championships. The Winter Classic represents the second leg of the series. Five hundred ninety-two pickleball players competed in the East Naples Winter Classic held January 26th-28th at East Naples Community Park. Players of all ages and skill levels ranging from 3.0-5.0 participated. The organized event, well-staffed with volunteers, ran smoothly and on time as all 44 pickleball courts were busy with action. Although the blustery days proved to be a bit of a challenge, the players persevered…and those who persevered the most came away with a medal.